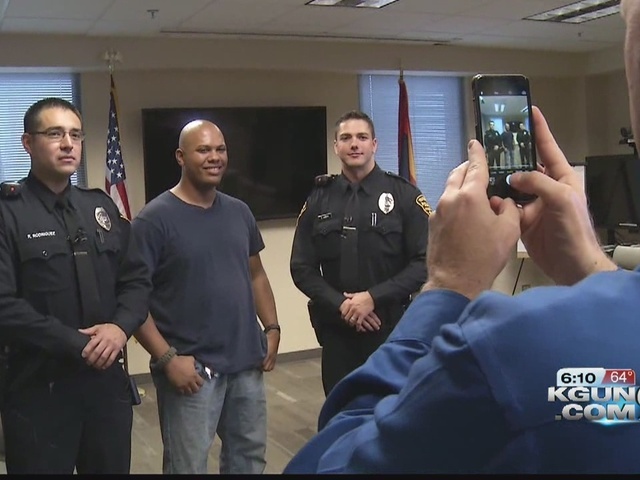 TUCSON, Ariz. — An Arizona man, whose Facebook post about his positive experience with police was seen across the world, finally got the chance to meet up with some of the officers that inspired his post. Steven Hildreth's post went viral last October after he shared his positive experience with Tucson Police. "He's a black man wearing a hoodie that was strapped. According to his post. That resonated with people," said officer Anthony Ammon. Friday morning he got a chance to meet them once again. "I wanted to be able to shake their hand and say thank you for that so thank you very much sir, thank you very much sir," said Steven Hildreth Jr. The meeting came as tensions between police and the citizens they protect were at an all-time high following two police shootings and the ambush of police officers in downtown Dallas. "There's obviously social movements where people believe in that situation if they're contacted by two non-African American police officers. That something bad is going to happen. That's not the case. Treat people with respect you're going to get treated with respect," said Ammon. Both officers were humbled at the outpouring of gratitude. "It's nice to know that there's people out there that appreciate us and know that we are out there being professional being respectful and law enforcement, that's who we are," said officer Rafael Rodriguez. Hildreth hopes his post will spark a trend of sharing positive stories showing respect and recognition to officers everywhere.